Back in the mid 1980s, I was crazy over the slogan featured in the Toyota car commercials, "Oh what a feeling! TOYOTA!" 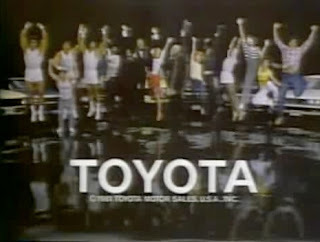 The commercials also included a crazy jump known as the "Toyota Jump." I recall one particular school day, right before Christmas vacation, my mom sent me to school with two gift-wrapped bottles of wine for my fourth grade teacher. Just a tip folks -- if your kid's a knucklehead, it's probably not the best idea to send them to school carrying two bottles of wine. I was kind of a joker as a kid -- actually that hasn't changed too much. One of my favorite jokes involved me reenacting the Toyota Jump for one of my classmates. On this particular day, I somehow forgot I was holding a very heavy paper bag with the two holiday wine bottles for my teacher. I jumped into the air yelling, "Oh oh oh oh what a feeling, TOYOTA!!!" What happened next was a complete and total disaster. I like to call it, the Toyota Jump gone wrong ... The paper bags handle snapped and the bottles smashed hard against the tile floor. Red wine gushed all over the classroom floor. The classroom stank. Kids were holding their noses complaining about the broken glass and mess. Some helpful classmates grabbed paper towels and we tried to clean it before the teacher came into the room. The rest is a bit of a blur. All I know is that day sucked. I remember thinking I had nothing to give my teacher for Christmas. I made a huge mess. And... I looked like the biggest FOURTH GRADE NOTHING ever. I'd say that goes down in history as one of my most embarrassing moments. That also marked the last time I ever did the Toyota Jump. Ever. 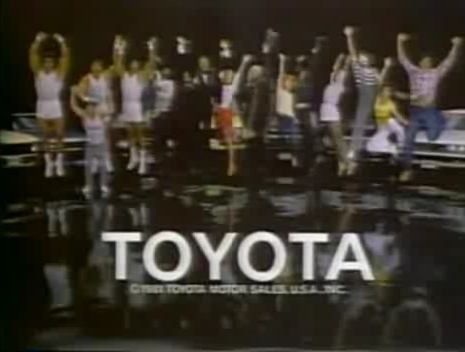 Watch this 1980s Toyota commercial -- at the very end you'll see a Toyota Jump in action. You were allowed to take wine to school??? I can't even imagine that! Catholic school in the 1980s, it was wrapped with a bow on it. My mom switched to Sears gift cards after that. Oh wow. That sounds awful! I think it's time for you to do the Toyota jump, agian. Oh, Toyota..the "oh whatta feeling" you experiences was humiliation! My most humiliating moment involved a jelly sandal, an annoying kid kicking me and a bucket of tartar sauce...too horrible to recount full details but suffice to say my jelly shoe ended up in the tartar sauce and I was the one looking like an idiot! And for the record, I was in fourth grade! Right up there with the Nestea Plunge. You poor kid. Still, it's a great story! Ally, I am really sorry but this was your most hilarious story. Add to it the fact that your mom switched to gift cards...oh hon, thanks for the laughs! I did the Toyota jump a couple of times. I won't lie. BTW, in Utah, Toyota had this commercial running that promised a pair of Tony Llama boots for every truck sold. Was that a national thing or just a Utah thing? Notsure. This was so hilarious. It was funny, yet not really funny at the same. I felt bad, imagining some poor kid who broke his teacher's wine (that's funny enough by itself)...wait I don't feel bad. Sorry, it's just damn funny.